NOTE: There has been a formulation change to the Hu IFN Beta Standard, please see the Product Notice located under the Documentation tab below for more information. No cross-reactivity against human IFN-α, human IFN-γ, mouse IFN-β or rat IFN-β. 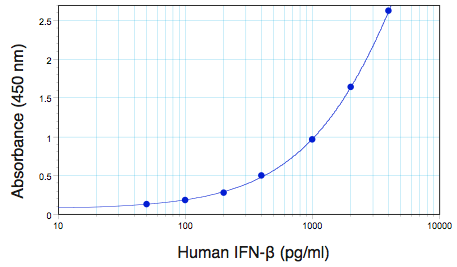 The VeriKine Human Interferon Beta ELISA Kit has been developed to measure levels of human IFN-β in buffers or tissue culture media (TCM) samples by sandwich enzyme linked immunosorbent assay (ELISA). It is developed for superior performance with intra-assay and inter-assay CVs of ≤ 8%. The lowest concentration of Hu-IFN-β that can be detected in a test sample is 50 pg/ml. This kit is not designed to measure Hu-IFN-β in human serum. The kit is based on an ELISA with streptavidin conjugated to horseradish peroxidase (HRP). Tetramethyl-benzidine (TMB) is the substrate. The assay is based on the international reference standard for human interferon beta (Hu-IFN-β) provided by the National Institutes of Health. IFN-beta is synthesized and secreted by fibroblasts and many other cell types in response to varied stimuli in Toll-like receptor (TLR) dependent and independent mechanisms. Pathogen exposure can result in the activation of transcription factors interferon regulatory factor 3 (IRF3) and NF-kB resulting in IFN beta production in a stimuli and cell dependent manner. Following secretion, IFN-β binds to type I interferon receptors on proximal or distal cells activating the JAK1-STAT signaling pathway. Activation of this signal transduction pathway leads to the expression of 2’-5’ oligoadenylate synthetases (2’5’ OAS), protein kinase R (PKR), MxA proteins, and interferon regulatory factor 7 (IRF-7). The upregulation of IRF-7 expression can exert a positive feedback on IFN-β production, whereas the induction of 2’5’ OAS activates a latent endonuclease known as RNase L. RNase L cleaves both viral and cellular single stranded mRNA, thereby limiting viral replication and dissemination. IFN-beta is present as a single gene in humans. The biological activity of IFN-beta can be functionally similar when compared to other type I IFNs, but can also exhibit distinct gene expression patterns as compared to IFN-alpha. In vitro binding studies suggest that IFN-beta binds to the Type I IFN receptor with higher affinity than the other Type I IFNs and this may regulate receptor internalization in a different manner. IFN-β has long been known to inhibit viral replication as part of the body’s innate antiviral response and it is currently used as a therapeutic for treatment of relapsing-remittent multiple sclerosis and some tumors. Staehelin et al. (1981) Methods in Enzymology, Vol. 79 (Pestka, ed. ), Academic Press, New York, 589-595. Kelder et al. (1986) Methods in Enzymology, Vol. 119 (Pestka, ed. ), Academic Press, New York, 582-587. Human IFN-β international reference standard provided by the NIH, reference no. Gb23-902-531. Pestka (1986) Methods in Enzymology, Vol. 119 (Pestka, ed. ), Academic Press, New York, 14-23. Moschera et al. (1981) Methods of Enzymology, Vol. 119 (Pestka, ed. ), Academic Press, New York, 177-183.